My mirror tilt function isn't working correctly, any one else have this problem? 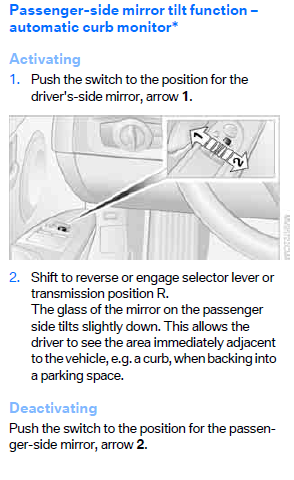 If you’re not aware, on a BMW the passanger side mirror tilts down when you put the car into reverse so you can better see objects on the ground such as lines and things like. I know you might be thinking I don’t park in the lines, but then there is always that one exception. Now, on my M3 and my 128i before the feature worked no problem; I put the car in reverse and the mirror dips. On the 328i, it doesn’t. Attached is a screen shot from the owners manual highlighting this feature. I don’t know why it’s not working. The electric mirror itself works fine, and I know the car knows it’s in reverse because my parking sensors come on, but the mirror doesn’t dip. Maybe you had to get a package I didn’t get to have it, or something. As far as I know it’s standard on all US spec BMWs going back to at least the E46. Anyone have any ideas what’s going on with it?